Combine water, lemon juice, salt and white pepper in a saucepan; bring to a simmer over medium heat and cook until reduced to one half. Remove from heat and allow to cool slightly. Lightly beat egg yolks in top of a double boiler. (A non-reactive bowl that will fit on a pot of simmering water without touching the water can be substituted if a double boiler is unavailable.) 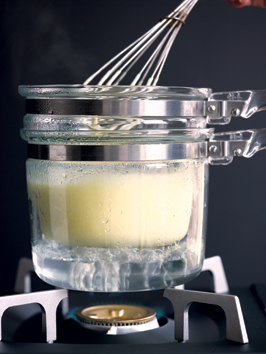 Pour a small amount of cooled lemon reduction into beaten egg yolks and beat with wire whisk to blend. Add remaining lemon reduction to egg yolk mixture. Whisk yolk mixture enthusiastically over simmering water until it thickens, taking care not to curdle the eggs. Slowly dribble in butter, whisking constantly. After the butter has been blended into the sauce, remove from heat and set aside. Beat egg whites to soft peaks. Whisk half of beaten whites into the sauce and adjust seasonings if necessary. Discard the remaining egg whites, or save for another use. Keep sauce warm for serving; cool what you do not use and reheat fearlessly in a double boiler. Tip: Add beaten egg whites to a hollandaise sauce or hollandaise derivative, and not only does it discourage the mixture from separating, but it allows you to reheat a cooled hollandaise.